At 9.40 am on Tuesday 26 August 1913 Dublin tram car men (drivers) and conductors pinned the Red Hand badge of the Irish Transport and General Workers‚ Union to their lapels and abandoned their vehicles. Within forty minutes most of the trams were moving again. The Dublin United Tramway Company chairman William Martin Murphy had contingency plans in place to use inspectors and office staff (many of them former car men) to replace the strikers. Trams would still not venture out at night, for fear of stoning, and crews would often carry revolvers for protection, but within a few days daytime services would operate relatively normally. 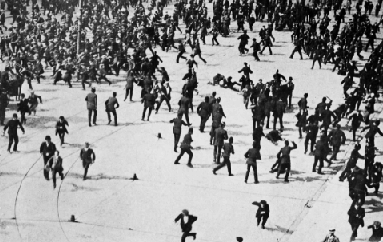 The dramatic opening of the 1913 dispute was a demonstration of weakness rather than strength. Normally tram strikes begin at daybreak with mass pickets to prevent vehicles leaving the depots. But on 26 August 1913, ITGWU leader Jim Larkin knew he could rely on less than 200 of the 800 DUTC employees. Another 200 Transport Union members had already been sacked by the company and the rest of the workforce frightened into submission. What followed was unbridled class war, only mediated by a distant British government distracted by domestic problems and the home rule crisis. Nearly twenty years earlier William Martin Murphy had helped fund the establishment of the Dublin Trades Council in 1886, then an eminently respectable body dominated by traditional craft unions. Murphy had always cultivated good relations with the craft unions, most notably the printers. He also paid good wages to his employees on the trams. A conductor could earn 21s 6d (£1.07) and a car man 28s (£1.40) a week at a time when most labourers earned between 16s (80p) and 20s (£1). But conditions were poor, with employees working up to seventeen hours a day. Heavy fines, suspensions and instant dismissal were used to maintain a military style regime. Worst of all, an informer culture was cultivated in which passengers and fellow employees were encouraged to report every misdemeanour. Murphy had no time for the syndicalist gospel preached by Larkin. The notion that the organised working class, in ‘one big union’‚ could use industrial action to overthrow capitalism was anathema to Murphy’s deeply conservative and intensely Catholic strain of Irish patriotism. He saw the ITGWU as a threat to the competitiveness of Irish companies, as well as representing a particularly pernicious form of modernisation. Murphy’s fear of the ITGWU’s ‘godless’ ideology was shared by most of Dublin’s middle classes, the Catholic church, business leaders, farmers and nationalist politicians. In contrast to Murphy, Larkin has always had a good press. However, contemporary trade union leaders found him at best exasperating, and at worst, impossible to deal with. William O’Brien, one of Larkin’s ablest lieutenants in the lockout, eventually ousted him as leader of the ITGWU. O’Brien would spend most of his later years promoting the myth that the 1916 signatory, James Connolly, was the real architect of the ITGWU’s future greatness. In the process O’Brien presided over the systematic destruction of ITGWU records detailing Larkin’s role in the union. In the long run the removal of documentation only contributed to the growth of lockout mythology. The reality was that while Larkin was more ideologically eclectic than Connolly he was a more formidable organiser and an incomparable public speaker. In August 1913 winning union recognition at the DUTC must have seemed eminently feasible. Over the previous six months, by using sympathetic strikes, Larkin had won a series of disputes that had increased wage rates for unskilled Dublin workers by between 20 and 25 per cent. Employers who refused to concede found their businesses blacked by other workers. The city’s carters and dockers, the backbone of the ITGWU, were Larkin’s most powerful weapon. Often the mere threat of sympathetic action was enough to force concessions. Anything less might well have failed in a city teeming with unemployed workers. Larkin’s greatest achievement and his most lasting legacy to the Irish labour movement was his ability to convince thousands of unskilled men and women, many of them illiterate and living on the breadline, not to pass pickets and accept that ‘an injury to one is the concern of all’. The tactic could only be countered by employers adopting a similar strategy—the sympathetic lockout. In a sense Murphy was Larkin’s most ardent convert—but he practised the syndicalism of the bosses. In 1911, using similar tactics, he had defeated the unions in the Great Southern and Western Railway, a victory so comprehensive that, while British rail workers took limited solidarity action with Dublin during the lockout, local railway employees remained quiescent. Only a month before the lockout, the city’s Chamber of Commerce and Trades Council had agreed, at the behest of the Lord Mayor, Lorcan Sherlock, to establish a conciliation board to resolve future disputes. Murphy was president of the Chamber but had been ill at the time. When he learnt that Larkin was seeking to establish a presence in the Tramway Company before the conciliation process was in place he was determined to forestall him, to prevent strategic advantage going to the ITGWU. Once committed, neither side could withdraw without conceding a major victory to the other. Even so, it is likely that the dispute would have petered out but for ‘Bloody Sunday’, 31 August 1913. Inflamed by the failure of the strike to stop the tram service, and spurred on by Larkin’s rhetoric, workers began rioting in Ringsend on Saturday 30 August. By nightfall the disturbances had spread to most of the city’s working class districts. Next day, due in part to the lack of control exercised by senior officers, members of the Dublin Metropolitan Police and Royal Irish Constabulary injured between 400 and 600 people in ferocious baton charges on O’Connell Street. Delegates to the British Trades Union Congress meeting in Manchester on Monday were outraged at the press reports. Much of their anger was directed at Dublin’s employers because they assumed that the local corporation, as in British cities, controlled the police force. Responsibility for policing rested in fact with the British authorities in Dublin Castle. The TUC committed massive support to the Dublin workers and over the next seven months more than £106,000 was donated in food, fuel, cash and clothing. While Bloody Sunday created unity across ideological and political divides in the labour movement, bringing together syndicalist revolutionaries such as Larkin and liberal supporters such as William Brace, the founder of the British Navvies’‚ Union, it caused deep dissension within Irish nationalist ranks. Despite the antipathy of many constitutional nationalists towards Murphy (as an anti-Parnellite he was no friend of Redmond’s) they saw Larkin as the greater threat. For forty years they had campaigned for home rule. Now that it appeared within their grasp, they sorely needed the support of both the governing Liberals and the rapidly rising British Labour Party to ensure the bill was passed. The Irish Party and its affiliates liked to present themselves as leading a united people with only a few recalcitrant unionists blocking the way forward. By a long-standing convention the Irish Party at Westminster supported social reform in Britain and the British Labour Party deferred to it on the question of whether such legislation should be extended to Ireland. When Irish suffragettes protested at the failure of the Irish Party to support votes for women within the proposed home rule parliament, or socialists objected at the party’s refusal to have free school dinners legislation extended to Ireland (because middle class ratepayers would have to foot the bill), British Labour held its peace. But now that class war had broken out in Dublin an increasing number of British trade unionists and politicians began to question this policy. Even within the Irish Party MPs such as T.P. O’Connor and Richard McGhee, who had been active in the British labour movement and knew its leaders intimately, expressed their concerns. After Bloody Sunday, for instance, McGhee wrote angrily to John Dillon that, ‘It will be a serious mistake for our entire Irish Party to remain silent as if it approved of the devilish work [of the police]’. He added, ‘The trade unions of Britain are stirred to the deepest indignation. I know nothing that will cause more injury than for those unions to think that we the Nationalist Party are indifferent to the conflicts of William Martin Murphy and his victims.’ When the Dublin Employers’ Federation, a Murphy creation, sent a ‘whining’ delegation to Westminster, McGhee told them their organised drive ‘on what they are pleased to call Larkinism was regarded by us as an attack on trade unionism’. Dillon was at his Dublin residence in North Great George’s Street throughout much of the lockout and was well aware of what was happening. He was, like McGhee, appalled by what he saw. However it was the activity of Larkin that appalled him. John Redmond, who spent most of that summer in Aughavannagh, was preoccupied by the North, as were other leaders of the party. It was largely left to Dillon to hold the line and, though he ranked the lockout as a greater threat to Irish Party hegemony than partition, his policy was to persuade colleagues that a studied public silence was the best approach where events in Dublin were concerned. Within the city most nationalists opposed the lockout, not least because the powerful lobby of publicans and shopkeepers within the city council was outraged at the flood of free goods from Britain. All but one of the city’s MPs were completely out of sympathy with the strikers. Three of them were so old or infirm as to be relatively out of touch with events generally. At the same time a number of nationalist councillors representing working class wards engaged in a careful balancing act to retain the support of both middle class ratepayers and working class voters. They were acutely aware that Larkinite candidates could take their seats in the forthcoming municipal elections of 1914. By 4 September 1913, Murphy had persuaded over 400 of Dublin’s employers to lock out any employee who refused to sign declarations forswearing the ITGWU. Within a few weeks at least 15,000 workers were locked out and dependent on the TUC food fund for survival. Thousands more, ranging from casual workers outside unions to hawkers and the self-employed, faced destitution because of the knock-on effects of the dispute. In contrast to the £106,000 raised by the TUC a distress fund established by Lord Mayor Sherlock raised a mere £6,482. Of this £2,000 was donated by Dr Charles McHugh, the Catholic bishop of Derry on behalf of the Lourdes pilgrimage fund, and another £2,435 by Dr William Walsh, Catholic archbishop of Dublin, from a diocesan collection. Less than £2,050 was raised by popular subscription. Clearly there was little sympathy for the locked out workers at home. The other main source of relief was the Society of St Vincent de Paul. Its records provide no regional breakdown for 1913-1914 of how funds were spent. Assuming that £10,000 of the £18,000 raised that year was spent in Dublin, a very generous estimate, it would work out at around 2s 3d (12p) for each of the 85,000 people assisted in the city. In contrast trade union members received about £7 2s 5d (£7.12p) each. What was more, workers received assistance as a right determined by their union contributions. Aid from the SVP was channelled, as was the Lord Mayor’s fund, through the Catholic church. Charity is, by definition, discretionary and all the evidence suggests assistance went to the ‘deserving poor’ or families where parents were thought likely to give their children to Protestant proselytisers in return for food and money. In fact a very bitter and unedifying battle developed between Catholic and Protestant food kitchens to win souls by feeding the starving. It was highlighted by a decision of M.H. Gill & Co, a Catholic publisher, to sack a Protestant employee with thirty-nine years service because of his voluntary efforts at the Dublin Central Mission Sunday food kitchen. The option for Gill’s was to face a boycott by co-religionists and financial ruin. A rally of Protestants to oppose the decision had no effect. The controversy proved a marker in the slow process by which the traditional Protestant hegemony of commercial life in the city was fading. Yet in some respects the lockout had far less severe effects than might be expected. For instance there were fewer admissions to the Dublin workhouses in 1913 than in preceding years. Whether this was because of more stringent rules by workhouse guardians afraid of being overwhelmed by the destitute, or because so many workers were in receipt of TUC aid, remains unclear. What is certain is that admissions to the workhouses returned to normal levels after TUC funding dried up in early 1914. On the other hand mortality rates did rise during the lockout with children most affected. In the third quarter of 1913 the death rate for children from infectious diseases rose by almost 50 per cent. The less than generous response of the city’s middle classes to the hardship of workers was partly due to Larkin’s ill-considered promotion of the ‘Dublin kiddies’ scheme. This was an attempt by Madame Dora Montefiore, a member of a prominent liberal Jewish family, to provide temporary foster homes for strikers’ children in Britain. Dr Walsh, who had been relatively sympathetic towards the strikers, denounced the scheme for putting the Catholic faith of the children at risk. He also believed it would expose them to the higher living standards of Britain and leave them discontented with their lot when they returned home. Catholic clergy mobilised ‘vigilance’ committees in Dublin and Dún Laoghaire, which prevented all but a small number of children from leaving the city. The supply of children rapidly dried up when the Murphyite press began publishing the names and addresses of parents. The tremendous effort put into preventing the children leaving Dublin was not paralleled by similar efforts to look after them at home. Apart from the trade union movement the only others to make serious efforts to feed strikers‚ children were activists in the militant wing of the female suffrage movement. While the controversy over Madame Montefiore’s scheme isolated the strikers from much of Irish society, Larkin himself contributed to the process. His intemperate language not only alienated many potential sympathisers within the country, but within the British labour movement. He repeatedly attacked the TUC leadership for refusing to sanction sympathetic strikes in Britain aimed at ‘blacking’ goods from Dublin. Larkin, and his supporters ever since, have argued that this would have forced the capitulation of Murphy and his allies. Such an analysis ignores the underlying realities. Larkin, as a revolutionary syndicalist, believed the lockout could act as a catalyst that would generate a general strike in Britain, bringing about the collapse of capitalism. His problem was that although syndicalism had taken quite a grip in Dublin, it was very much a minority interest within the TUC. Many British unions were still recovering from three years of almost constant strikes between 1909 and 1912 that had left them weakened and, in some cases, nearly bankrupt. Ironically union density in most British ports was much lower than in Dublin. If Larkin could not close Dublin port with around 50 per cent of workers unionised there was little hope of British unions achieving better results with 15 per cent unionisation. The more Larkin castigated British trade union leaders for their cowardice the more he isolated himself. Ultimately he would be disowned at a special TUC conference convened in December 1913 specifically to discuss the Dublin dispute. Another factor in the defeat of the workers was the secret assistance of the Shipping Federation. When the lockout began, the federation, the largest employers‚ organisation in the UK, resisted appeals for help. This was partly because of commitments to strike-breaking activities elsewhere, but also because it did not believe Dublin employers had the will to fight. By October the federation had changed its mind and was supplying 600 strike breakers to keep Dublin port open. Most of them were accommodated on federation vessels in the Alexandra Basin for protection against intimidation. What was not known at the time was that the federation spent nearly £10,000 to help out smaller Dublin employers in danger of collapse during the dispute. Lord Iveagh, head of the Guinness dynasty, contributed a further £5,000. Murphy used these resources imaginatively. For instance a fund was set up for smaller employers to subsidise the purchase of motor lorries, which, it was quickly discovered, were cheaper to run and more productive than the traditional horse and cart and less susceptible to interference by mass pickets. In addition the employers could call on the resources of the state. Military escorts supplemented those of police during the dispute. No fewer than 400 members of the ITGWU appeared before the courts on charges arising out of the dispute; many were subsequently imprisoned. In contrast, although strike breakers were involved in several shooting incidents leading to death or serious injury only one was convicted, and he was given a suspended sentence. Like the Black and Tans later, strike breakers were castigated as the sweepings of English prisons and slums. The evidence suggests, however, that at least a third were Irish. Their intervention spurred the ITGWU to establish the Irish Citizen Army. Larkin also decided to contest every prosecution of union members in the courts. Much has been written about the influence of Connolly on Pearse’s thought, but any close study of their writings and speeches in 1913-1914 would suggest that Pearse exercised at least as strong an influence on the labour leader’s thinking about the national question. The lockout played an important role in blending the social and political agendas of separatists of varying hues. But it had little immediate impact on the local political scene. In the January 1914 municipal elections Larkinite candidates in Dublin put forward the most advanced social and national programme so far seen in Ireland. But only one of ten candidates was elected and, although they came close to winning in several other constituencies, the result was all the more devastating because of the high hopes with which they entered the contest. Isolated by the TUC in Britain, rejected by the electorate in Dublin and facing starvation because the food ships had stopped, Dublin workers had to accept the inevitable and return to work. Despite various efforts by church leaders, British trade unionists and government agencies, Murphy refused to compromise. Attempts by a minority of employers to find a peace formula were equally robustly rejected. By February 1914 Murphy had achieved total victory, or so he thought. What none of the protagonists had foreseen was the advent of the First World War just six months later. Consequent severe labour shortages allowed the ITGWU, and the trade union movement generally, to recover from defeat. By 1920 the ITGWU was Ireland’s largest union with 120,000 members, compared with its pre-war peak of 24,135 at the start of January 1913. In retrospect the lockout represents the coming of age of the Irish trade union movement. Perversely, the aid from Britain and the well meaning but ineffectual interventions of the TUC in the dispute made the younger generation of Irish trade union leaders all the more determined to assert their independence. During the lockout people ranging from female suffrage campaigners to Catholic curates began to question in fundamental ways what sort of society home rule Ireland would be. Issues as relevant today as then, such as children’s rights and the effects of the internationalisation of capital (globalisation) were hotly debated. The lockout was the first major urban conflict to impinge itself on the national consciousness. 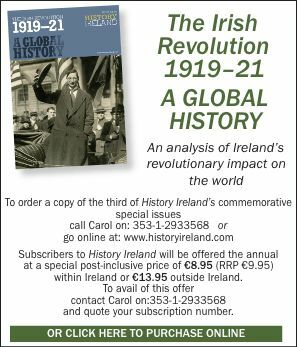 Ironically the next great urban event was the Easter Rising and the lockout was relegated to the role of curtain raiser to the national struggle. Padraig Yeates is industry and employment correspondent of The Irish Times. C.D. Greaves, The Irish Transport and General Workers Union: the formative years (Dublin 1982). D. Nevin, James Larkin: lion of the fold (Dublin 1999). TCD Curriculum Development Unit, Dublin 1913: a divided city (Dublin 1986). P. Yeates, Lockout: Dublin 1913 (Dublin 2000).